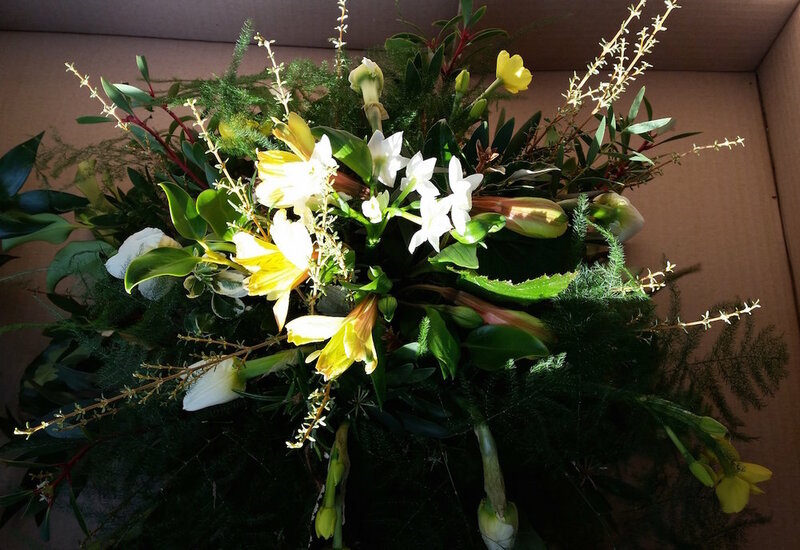 Sympathy and Funeral Flowers - The Spotted Dog Flower Co. Flowers are an important part at every stage of our lives, none more so than when we say farewell to loved ones. Whether it’s a bouquet of flowers to let someone know you are thinking of them, a sheaf of flowers to pay last respects at a funeral or the full decoration of the casket of a loved one, we feel truly privileged when requested to undertake that service. All our flowers are grown in our field or sourced from other British growers. They are seasonal, scented and freshly picked. We are always happy to incorporate flowers or foliage from the garden of the deceased or their family and to make the tribute truly personal. Flowers and herbs have special individual meanings and we include rosemary for remembrance. We never use cellophane or floral foam and all our frames are made from willow and string which are eco-friendly and particularly suited to natural burial grounds, but also, like our flowers, much kinder to the environment at the churchyard or crematorium. We are very happy to supply flowers that can be re-purposed after the funeral into posies that the family can retain and in one instance, for example, designed the whole casket display, incorporating many bunches of summer flowers that the family were able to cut away afterwards and redistribute to their loved ones. A small sample of our work is shown but we treat every commission as an individual, no two will ever be the same but they will be bespoke to the requirements of the family and a reflection on the life of the deceased. Contact us at any time to discuss your requirements on 07794 207168.